French niche line Memo has launched Marfa Spices, a new unisex fragrance. Marfa Spices is a flanker to 2016's Marfa. When Marfa mixes its tuberose with spices, an amazing interlude for a journey of renewed pleasure. Memo Paris journeys are not always long. During brief yet extraordinary stopovers, a fragrance can be dreamed up dressed up in gold and light. The notes include cardamom, orange blossom, tuberose, agave accord, sandalwood, cedar and white musk. 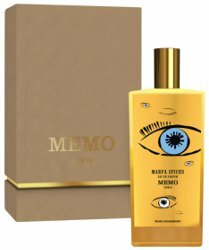 Memo Marfa Spices is $500 for 75 ml Eau de Parfum. Ehh, they lost me at tuberose and OB. More for everyone else! ???? Right where I got interested! LOL! “Memo Paris Journeys are not always long”. That’s not the kind of copy that’s going to spur me to pay $500 for a fragrance.